These locations let you choose a server nearest your US, European or Australasian users. 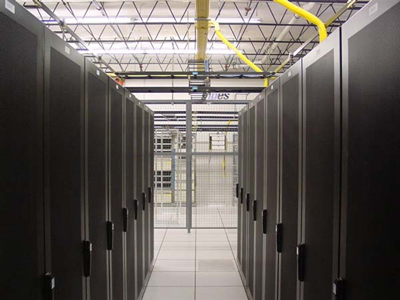 Each data center has redundant UPS systems, generator backup, closed circuit monitoring, card key access, 24-hour guards and redundant a/c systems. Rest assured your hardware is being well taken care of. Lots of low latency bandwidth. Typically you can 'ping' other US servers in an incredibly fast 20ms or less. Multiple, Gigabit Connections to the Internet. So even multi-megabyte files can be downloaded in seconds. 24x7 Server Monitoring. And our sysadmins are paged if anything is wrong. It's "peace of mind" hosting. The Dallas-based data center we use, run by TierPoint, provides a reliable, fast and affordable mix of BGP routed bandwidth. The data center run a Cisco networking environment. And is staffed 24x7 by technicians who perform all our remote hands work (e.g. changing drives, memory or swapping servers). TierPoint take their power seriously. They have 4 autonomous 2N power plants; 11MW of utility power; and 6 backup diesel generators on standby. TierPoint is very secure. Their 68,000 sq ft facility is SSAE16 and SAS 70 Type II audited; single story; single tenanted; FM-90 rated wind roof. Multi-layered security includes card key, pin, and biometric scans at the facility entrance; intrusion detection systems and full CCTV surveillance. The servers we purchase and colocate at the Dallas data center are the latest and greatest our money can buy, so we are able to offer customers great pricing on extra memory and disk space. If you are not sure which data center to go with then we recommend you setup your VPS or dedicated server at this data center. We host most of our customers at this facility. Order a Dallas-based VPS, or a Dallas-based dedicated server. Sample IP. The UK-based data center we use is located in Reading (just outside of London). Diverse power feeds from utility operators. Inert fire suppression gas system. 24x7 staffing, man trap secured entry. 40Gbit+ direct peering with Telehouse POP and Equinix. 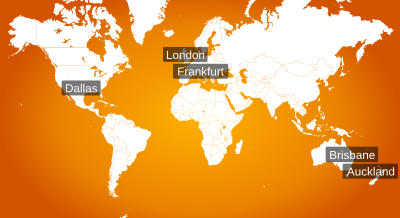 We recommend our London data center if most of your users are in Europe and low latency is critical to you. Order a London-based VPS or London-based Dedicated Server. We provide dedicated servers in Australia from a Brisbane-based data center. The data center has two Gigabit ethernet links to SingTEL/Optus, a Cisco-based network core, and on-site staff 24x7 for rapid response to hardware emergencies. If you or your customers are located in Australia, Asia or New Zealand then one of our Brisbane-based VPSs is a good choice. Bandwidth in this part of the world is not cheap, so data transfer allowances on these servers are lower than at the other data centers we use. has Gigabit Ethernet over copper and ATM throughout our internal infrastructure and Gigabit Ethernet optical fibre uplinks to all external carriers. 24 hour 7 day Emergency support. 24 hour 7 day On Site Security. N+1 UPS Power Protected Servers. N+1 Caterpiller Generator Backup Power. N+1 feeds from state power grid. Order a Brisbane-based VPS or an Brisbane-based dedicated server. Uptime Institute Tier III certification. Hot and cold aisles for peak cooling power efficiency. Cardboard- (and dust-) free data halls. Financially stable, publicly listed data center company. Fenced, secure bio-metric entry, 24x7 staffed and CCTV. Reliable, fast and affordable data transfer. Our NZ-based hosting plans are offered out a data center in Auckland, New Zealand. Order an Auckland, New Zealand-based VPS or an Auckland, New Zealand-based dedicated server. Order a Frankfurt, Germany-based VPS.